Alan Hollinghurst, author, on the Uffington White Horse. GB Why have you chosen the White Horse? AH It’s the first work of art that I can remember, and through much of my childhood the oldest that I had seen. 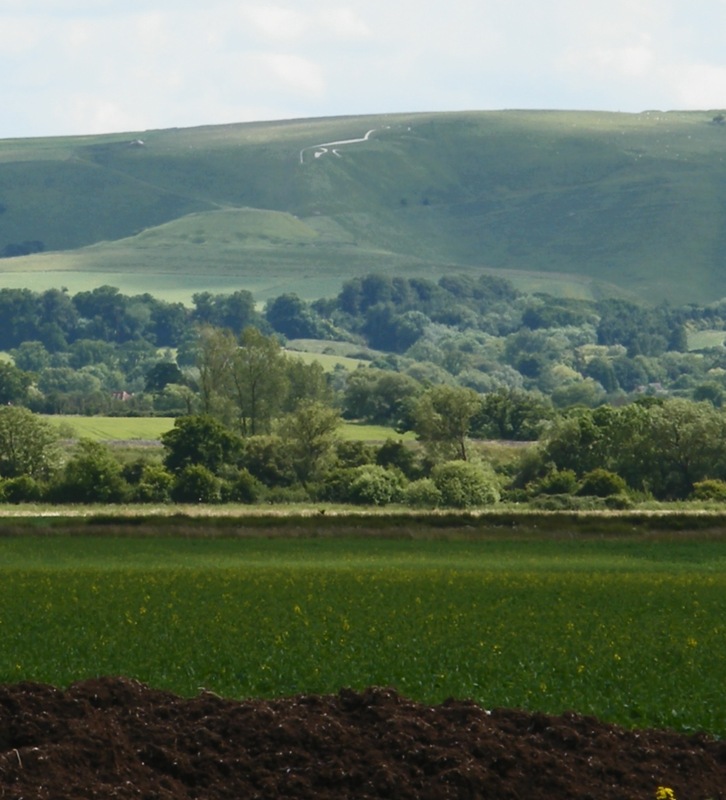 From Faringdon, 5 miles away, the Berkshire Downs formed our southern horizon, and I spent a lot of time on a farm at Woolstone, the hamlet directly beneath the White Horse Hill. I played all round the Horse frequently as a boy, and once you’re inside the figure of course you can’t see it all. It’s hard to see it whole from anywhere except from the air, though sometimes from the car you would see it riding above the Vale with surprising clarity. It has an aura, which was qualified but not dispelled by familiarity – a bit like living in a cathedral close, perhaps: though the Horse is more reserved, no one knows exactly what it means or what collective decision resulted in its being made. There’s more to it than you can know, and the experience of it is of much more than itself, since the views when you’re up there are immense. Space, sunshine and wind are all a part of it, as well as vertigo at the plunge of the slope into the Manger, the great scoop of the hill below. GB This white horse is much older than all the others – It’s prehistoric, whereas the Marlborough and Cherhill horses are 18th century. Does this add to its beauty? AH Well the others are childishly literal things, folk-art like pub-signs; they’re not even thinking of being beautiful. The 18th century could never have produced anything that combined the awesome insouciance and mythic presence of this horse. It’s tribal, it may be 3,000 years old, and it has presided enigmatically over the lives of unimaginable generations of people. I think I have a polar thing about beauty – I’m drawn to books, buildings, pictures that bear a strong stamp of personality, and of highly individuated style, but I’m also very moved by things in which personality is largely, or completely, effaced. I’m a city person who harks back all the time to landscape. The Horse, being chalk, is of the essence of its own landscape. GB Are you interested in the symbolism of horses? AH Not particularly. And this may not even be a horse, though I find it hard to unthink it as one, and I see that it gains an incalculable force from being so powerful and prestigious an animal. Horse-power, as it were. GB Do you tend to prefer more stylized visual art to realism? AH I’m a realist writer, I suppose, valuing an exact description of things; but my taste isn’t limited to that, and description itself can take many forms. Though I didn’t know it as a boy, this horse was giving me an early lesson in design and in semi-abstraction. It’s like a horse drawn by Picasso. It’s in a bit of country strongly marked by humans at an early stage – earthworks, hill-forts, prehistoric roads, burial mounds – so it was perhaps part of a more subliminal education in the beauty of English landscape; even the two hawthorn trees on the road that curves up the wall of the Manger seem to me now inevitable elements of the design. GB There are replicas of this horse as far away as Mexico and Georgia. Do you think there is always an urge to replicate beautiful things? AH I’ve just looked at a photo of the Ciudad Juárez White Horse – it’s a lot bigger, and faces the other way, but what you feel most of all is that it has no relation to its landscape (it’s drawn on to the lower slope of a brown hill in whitewash) or to its local culture. It’s harmless but also pointless: what’s it doing there? Which is a very different question from asking what the original White Horse is doing there. Perhaps because the original is so impersonal I don’t feel the confusion about it I would about a copy of a painting. It’s more like the version of the Grand Canal in Las Vegas. AH I use the word beautiful all the time, as a term of high value – to claim and identify the beauty of something gives me an emotional release subtly distinct from and additional to that effected by the beautiful thing itself. Beauty demands surrender, an echoing back, some inward involuntary applause. I feel that responsiveness to it is fundamental to my sense of who I am, and what I live for. I’m quickly alienated and bored by things that don’t give an opportunity for this kind of response; therefore, perhaps, all the more keen to find it in less likely places; but on the other hand wary of any too calculated attempt at beauty, for its own sake, as a form of fantasy. Beauty is clearly not synonymous with truth, but it’s flimsy without truth to experience. That way tends towards kitsch. I love the ravishment of the unthought-of and unanswerable thing – the White Horse certainly makes that primal claim.